Mother and juvenile Pacific walrus. 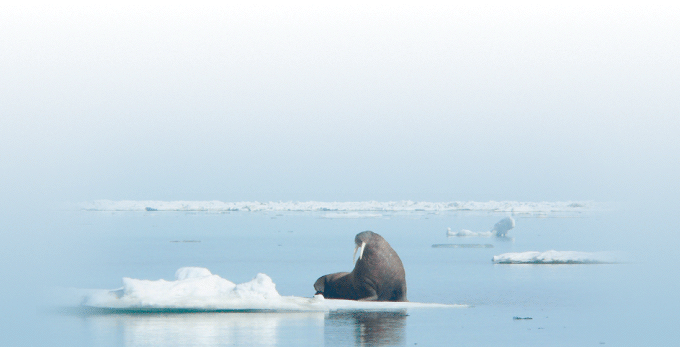 Sea ice plays an important role in the life of the Pacific walrus (Odobenus rosmarus divergens). U.S. Geological Survey (USGS) scientists are seeking to understand how losses of sea ice during summer over important foraging grounds in the Chukchi Sea will affect walruses. USGS scientists recently modified a remotely deployed satellite radio-tag that will aid in studying walrus foraging habitats and behaviors. Information from the tags will help USGS understand how walruses are responding to their changing environment. The Pacific walrus is a large pinniped, resident in the Bering and Chukchi Seas of Russia and Alaska, and is one of four marine mammal species managed by the U.S. Department of the Interior. Walruses feed on clams and a wide variety of other invertebrates from the seafloor. They rest between feeding trips on sea ice or land. Sea ice provides walruses with a resting platform, access to offshore feeding areas, and seclusion from humans and predators. The constant motion of sea ice transports resting walruses over widely dispersed prey patches. In winter, Pacific walruses live amid the dynamic sea ice in the Bering Sea. In spring, as the ice edge recedes northward and into the Chukchi Sea, most adult males shift to using land to rest between feeding trips, while adult females and young remain with the sea ice (Fay, 1974; 1985). Walruses can have a large effect on their prey and play an important role in the Arctic ecosystem by influencing the structure of benthic invertebrate communities. They can eat more than 50 clams during a single 7-minute dive to the seafloor and consume 35–50 kilograms (77–110 pounds) of food per day. 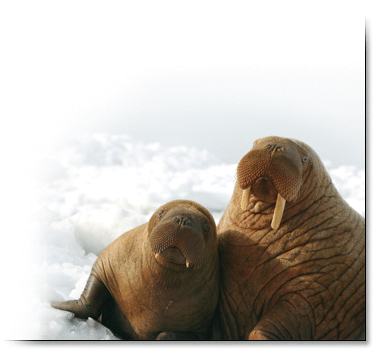 Pregnant and nursing walruses consume even more food (Fay, 1985; Born and others, 2003). As walruses root along the seafloor in search of food, they plow through large quantities of sediment (Nelson and Johnson, 1987; Nelson and others, 1994). They remove large quantities of prey from the seafloor, affect the size structure of clam populations, mix bottom sediments while foraging, create new microhabitats from discarded shells, and generate food for seafloor scavengers from uneaten scraps of prey (Oliver and others, 1983). Although walruses are capable of deep diving (greater than 250 meters [Born and others, 2005]), they usually feed in waters less than 80 meters deep over the continental shelf where their prey are more abundant and easier to obtain than in deeper waters (Fay and Burns, 1988; Jay and others, 2001). The extent of Arctic summer sea ice has decreased sharply over the past several decades (Stroeve and others, 2007). 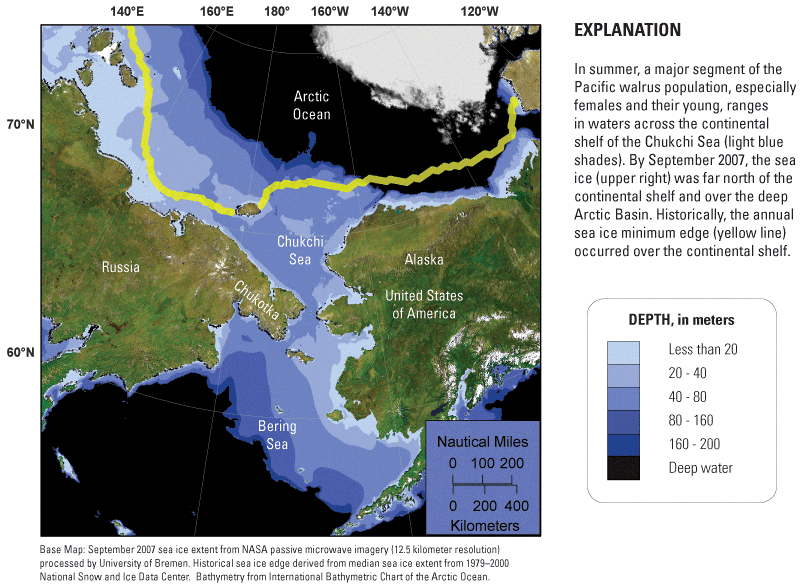 Sea ice is more frequently disappearing from the continental shelf of the Chukchi Sea during summer months. In 6 of the last 9 years, the Chukchi Sea shelf was ice-free—with periods of no ice cover extending from 1 week to as much as 2.5 months. In contrast, there was always some ice over the Chukchi Sea shelf in all of the previous 20 years (1979–98) (passive microwave satellite imagery; Cavalieri and others, 1996 ). When the sea ice recedes over the deep ocean basin, walruses must either continue to haul out on the sea ice with little access to food, or abandon the sea ice and move to coastal areas where they can rest on land. During the record minimum sea ice extent in summer 2007 (National Snow and Ice Data Center, http://nsidc.org/news/press/2007_seaiceminimum/20071001_pressrelease.html), the Chukchi Sea shelf contained little to no ice for about 80 days and several thousand walruses hauled out on previously unused shores of northwestern Alaska (Joel Garlich-Miller, U.S. Fish and Wildlife Service, oral commun., 2007). During autumn 2007, tens of thousands female and young walruses began using resting areas along the northern coast of Chukotka, after sea ice was no longer available. There, a few thousand mortalities were reported, apparently from trampling due to disturbances that caused adults to stampede into the water (Anatoly Kochnev, ChukotTINRO, oral commun., 2007). As more walruses haul out on land instead of sea ice, nearshore prey populations will be subjected to greater predation pressure. Today, it is unknown whether more concentrated foraging by walruses will change or deplete nearshore prey communities, or if walrus energetics will be affected if prey do become less abundant. A better understanding of walrus movement and foraging patterns is necessary to appreciate the ways in which decreasing availability of sea ice may affect walruses and the prey upon which they depend. This understanding will provide policy makers and regulatory agencies with information needed to address emerging issues related to climate change, such as new transoceanic shipping opportunities and increased resource development in the Arctic. Pacific walrus with satellite radio-tag. To begin to understand where walruses go when the ice edge retreats off the continental shelf and over deep waters of the Arctic Basin, USGS researchers attached satellite radio-tags to walruses in the eastern Chukchi Sea. To avoid the difficult task of capturing walruses on sea ice, USGS developed a tagging system that uses a crossbow to deploy the radio-tags (Jay and others, 2006). Radio-tags were attached to nine walruses offshore of Barrow, Alaska, in June–July 2007, while the ice edge was still over the continental shelf. 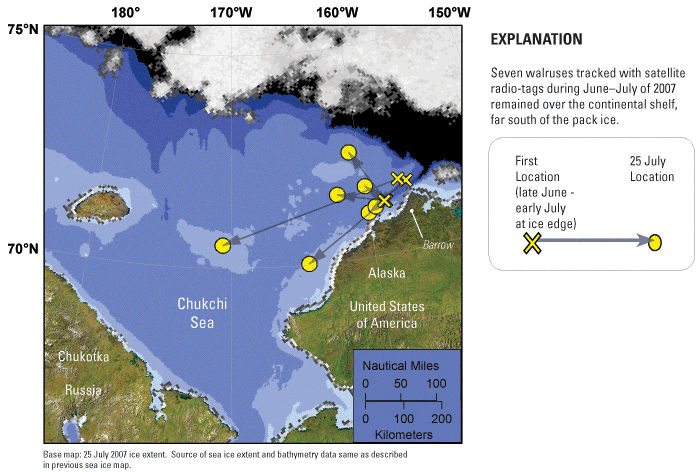 The tracking data showed that walruses rested on remnant ice floes that remained over the shallow waters of the eastern Chukchi Sea as the main ice edge retreated over deeper water. These observations suggest that walruses will exploit sparse ice to maintain access to preferred foraging areas over the continental shelf. USGS researchers developed a new satellite radio-tag to record when walruses were feeding or not feeding. Data from these tags will allow researchers to identify foraging areas and compare activity budgets of walruses foraging from shore in ice-free conditions and walruses foraging from ice in offshore habitats. A prototype of the foraging-tag was deployed on a male walrus in the southeastern Bering Sea in September 2007, and yielded a continuous chronology of hourly foraging status for almost 2 weeks. The movement patterns and habitats used by this walrus were consistent with findings from previous studies of walruses in this region. The foraging-tag promises to be an important tool for identifying when and where walruses forage under different sea ice conditions. This information will be critical for managing the expansion of offshore resource development activities and for understanding the consequences of summer sea ice loss due to climate change. Born, E.W., Acquarone, M., Knutsen, L.O., and Toudal, L., 2005, Homing behaviour in an Atlantic walrus (Odobenus rosmarus rosmarus): Aquatic Mammals, v. 31, no. 1, p.23–33. Born, E.W., Rysgaard, S., Ehlmé, G., Sejr, M., Acquarone, M., and Levermann, N., 2003, Underwater observations of foraging free-living Atlantic walruses (Odobenus rosmarus rosmarus) and estimates of their food consumption: Polar Biology, v. 26, no. 5, p. 348–357. Fay, F.H., 1974, The role of ice in the ecology of marine mammals of the Bering Sea, in Hood, D.W., and Kelley, E.J., eds., Oceanography of the Bering Sea: Fairbanks, University of Alaska, Institute of Marine Science, Occasional Publication No. 2, p. 383. Fay, F.H., 1985, Odobenus rosmarus. The American Society of Mammalogists. Fay, F.H., and Burns, J.J., 1988, Maximal feeding depth of walruses: Arctic, v. 41, no. 3, p. 239–240. Jay, C.V., Farley, S.D., and Garner, G.W., 2001, Summer diving behavior of male walruses in Bristol Bay, Alaska: Marine Mammal Science, v. 17, no. 3, p. 617–631. 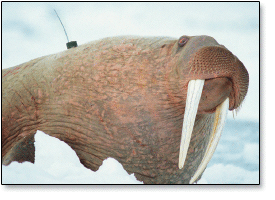 Jay, C.V., Heide-Jørgensen, M.P., Fischbach, A.S., Jensen, M.V., Tessler, D.F., and Jensen, A.V., 2006, Comparison of remotely deployed satellite radio transmitters on walruses: Marine Mammal Science, v. 22, p. 226–236. Nelson, C.H., and Johnson, K.R., 1987, Whales and walruses as tillers of the sea floor: Scientific American, v. 256, p. 112–117. Nelson, C.H., Phillips, R.L., McRea, J., Jr., Barber, J.H., Jr., McLaughlin, M.W., and Chin, J.L., 1994, Gray whale and Pacific walrus benthic feeding grounds and sea floor interaction in the Chukchi Sea: U.S. Geological Survey, Menlo Park, California, Technical report for minerals management service/IA No. 14157, OCS Study MMS 93-0042, 51 p.
Oliver, J.S., Slattery, P.N., O’Connor, E.F., and Lowry, L.F., 1983, Walrus, Odobenus rosmarus, feeding in the Bering Sea—A benthic perspective: Fishery Bulletin, no. 81, p. 501–512. Stroeve, J., Holland, M.M., Meier, W., Scambos, T., and Serreze, M., 2007, Arctic sea ice decline—Faster than forecast: Geophysical Research Letters, v. 34, L09501, doi:09510.01029/02007GL029703.